In its latest issue (November 2012), the ADAC ran a short post about reimbursement on delayed flights. As regulations and global weather change, there are continuous updates on this matter. Here is the latest: If your flight has been delayed by three hours or more, you are entitled to be reimbursed between euro 250 and 600. This came from the latest ruling of the Europäische Gerichtshof (European Court of Law) in Az. C-581/10 and C-629/10. 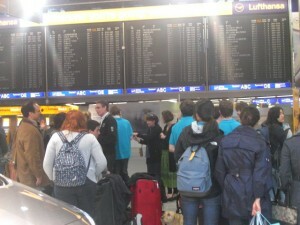 Their reasoning stated that a three-hour delay equals a flight cancellation. In case of flight cancellation, reimbursement is generally paid. Therefore, this applies to delayed flights of three hours and more as well. Please keep the small print in mind – in case of weather chaos, etc., airlines in general do not reimburse. Please check your airline’s website for further details. Europe’s most expensive Christmas tree, sparkling with thousands of lights, represents a powerful contrast to the gloomy euro crisis. The tree is located at the Frankfurt airport. The Squaire’s atrium makes a fine host for the tree, which is equipped with 8.000 LED lights and 40.000 Swarovski crystals. The 20-meter (60-foot) tree weighs 6.000 tons and took three weeks to decorate. This Christmas tree jewel cost euro 2.5 million.